Well, friends, I didn't plan on taking a blogging break, but I guess that's what happened. The main reason for my blogging absence is that we have been busy! I have been dreading writing this post, but here goes. We moved! That's right. We sold our cute little bungalow. It's a long story, but basically we were miserable. Over the past year we watched as our street turned into one rental property after another. In addition to other questionable tenants moving in up and down the street, our next door neighbors, who had always been a bit of a pain, became a little more....how should I say this politely....ummmm....I'll leave it at "more annoying." I'll spare you the details, but believe me, you know it was bad if I was willing to give up my cute little garden. We weighed our options and in the end realized that we just needed to get out of there. So, with that decision made we began the process of selling our place. In the process I of course took thousands of pictures of our first home. In honor of our big move, I've decided to put together a little list of things I'm going to miss the most and things that I'm happy to say farewell to (No, I didn't take pictures of the neighbors, but they would be at the top of the list). 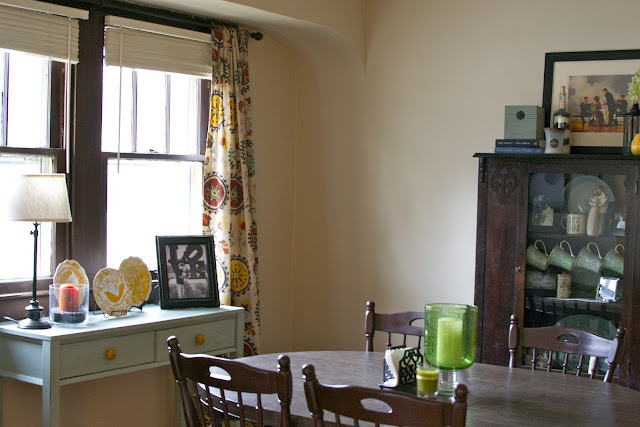 I am going to miss my little dining room, the original windows, and all the original wood trim and window casings. A lot of the houses in our neighborhood have white painted trim, so we always felt lucky that our trim was in its original condition. I am especially going to miss our kitchen that we remodeled. 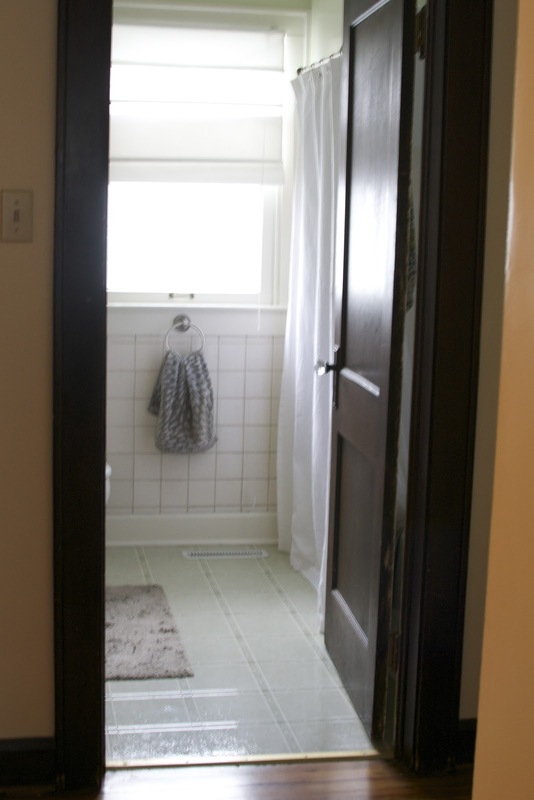 Dustin removed the green tile and replaced it with white beadboard. 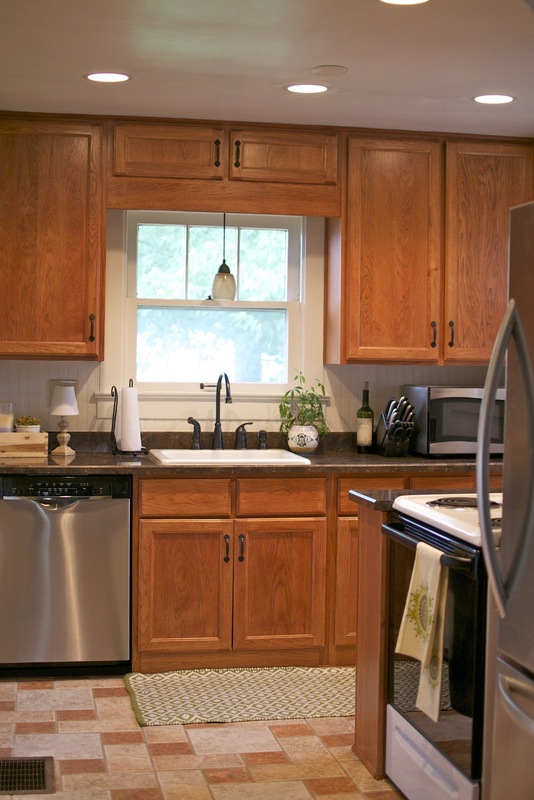 We also replaced the countertops, painted the trim white, painted the walls, updated the sink, and replaced the lighting. We also updated most of the appliances to stainless steel. While our little bathroom served us well, I will be thankful to add a second to our house. Here's a before shot---the green trim was a killer. While I have blogged on here about my raised garden bed, I will admit that it was frustrating to have such a tiny space for gardening. 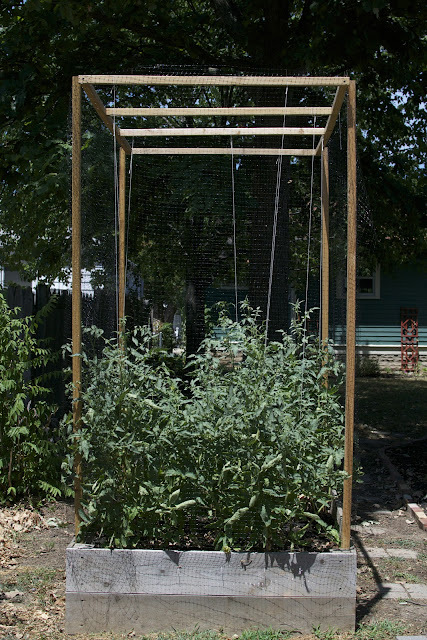 The garden was also located nearest to the neighbors meaning I always had to keep headphones in if I wanted to keep my sanity (AKA avoid hearing lovely baby mama drama or screaming kids). It just wasn't the most ideal space, but I am proud of that raised bed that my hubby built for me and all the yummy veggies that came out of it. Selling our first house was an incredibly bittersweet experience. Dustin and I thought we'd live there for years and years, so saying goodbye was a very sad day. Overall, we are looking forward to more space and a second bathroom (!! ), but will always remember our first little house.